Instead of just the recipe I will explain why I decided to make tortilla soup and how I came up with my version (which is very similar to Annalisa’s — wonder how that happened?) followed by a discussion of the ingredients. 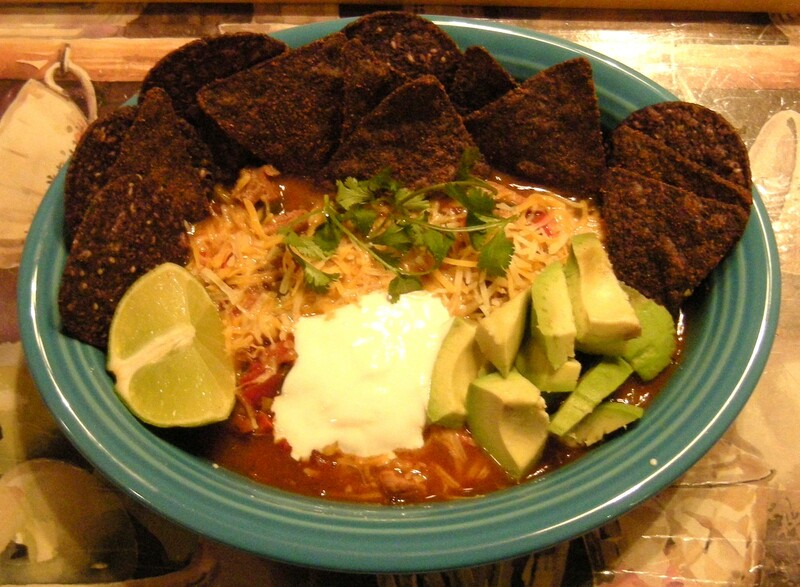 I liked the tortilla soup at a local restaurant chain that no longer exists due to a health issue associated with it. Their version was a very simple tomato base with very little else in it except a few garnishes. When the restaurant closed I began looking fora tortilla soup mix since I was intimidated at the thought of making it from scratch. But like most mixes I never found any that were very good. Then I began looking at online recipes trying to find one I liked. Over time I came up with my own version which came about by choosing the combination of ingredients that I liked and making it over and over adjusting the amounts until I liked the final results. My final recipe follows with a discussion of how I vary it depending on what I have on hand or cannot find at the store when I make it. The soup in the picture to the left is now ready for the corn, beans and thickeners to be added and then cooked about another half hour before serving. Saute the garlic and onion in oil for a few minutes until softened. Add jalapenos, poblano peppers along with the chili powder, cumin, and cayenne stirring while you saute it a few minutes longer. Add the chipotle salsa stirring all together and let the flavors combine about 5 minutes. Add the chicken meat and stock and let it simmer 15 minutes longer. Add tomatoes and salsa and simmer another 20 minutes. Taste and adjust spices at this point. Add beans and corn along with tomato paste and crushed tortillas or masa harina. Continue to cook until beans and corn are heated and as thick as you like it about 30 minutes. To serve soup: Either ladle it into a plain bowl or over some shredded cheese. The cheese will thicken the soup more. Then garnish with more cheese if desired, a sprinkle of green onions and cilantro, a few avocado chunks, a dollop of sour cream and a lime wedge with tortilla chips around the edges. My original recipe I used two cooked shredded chicken breasts, but my husband and I prefer dark meat. I use either a whole chicken or chicken parts or just legs and thighs if I’m making my own chicken broth. I cook the chicken with onion, carrots, celery, a few peppercorns and a little sea salt. When it is falling off the bone, I pick the meat off and strain the broth. Typically I cook the chicken and make the broth the day before and then refrigerate it. The next day I skim off the chicken fat that thickens on top of the broth. Often my soup has a lot more chicken meat than needed so I think for this recipe 2 -3 cups of shredded chicken is plenty. Sometimes I use canned organic chicken broth and prepare the shredded meat before I start the soup. In my original recipe I used green bell pepper instead of poblanos which tend to be hotter although they vary in hotness. Since I prefer their taste and more heat I switched to them. I often buy peppers and chop them up and freeze them for when I make soups and chilis. I used home canned tomatoes until I run out, then canned ones from the store. Originally I used a small jar of Pace Chipotle Salsa but it is no longer available so I substitute any other brand of chipotle salsa or sauce that I find or a jar of Medium or Hot Mexican salsa/sauce and I add some chopped up canned chipotles in adobo sauce (see picture) that can be found in the Mexican food section of many grocery stores. Adjust the amount needed because it depends on how much heat you want to add. I recommend starting with 2 t and add more until it suits your tastes. The chipotles are what really adds heat to this soup. I chop them up with scissors as fine as possible and add however much I want leaving the seeds in them. To add less heat the seeds need to be removed. Cayenne pepper adds a different kind of heat so adjust the amount to suit yourself. Rinsing the beans reduces their sodium content and some of the additives. I prefer the beans listed, in the recipe but any beans may be added. Notice that I do not add salt to my soup except when I make the broth as I think it gets enough from tomatoes, canned broth and beans as well as chips that are added. Adjust salt to your own taste preferences. I used red or blue chips (picture above) but if you cannot find them. plain ones will work too. Or buy corn tortillas and cut them into strips and brush them lightly with olive oil season them with chili powder (optional) and put them on a grill pan until they lightly browned and then turn to lightly brown on the other side. Originally I planned to make this blog about gathering and preparing food from the wild, but discovered I have too many other cooking ideas that I’d like to share. I plan to intersperse some of my favorite soups, stews and chilis in the next few blogs because they’re so appropriate for this cold weather. Also some of them are based on wild meats. 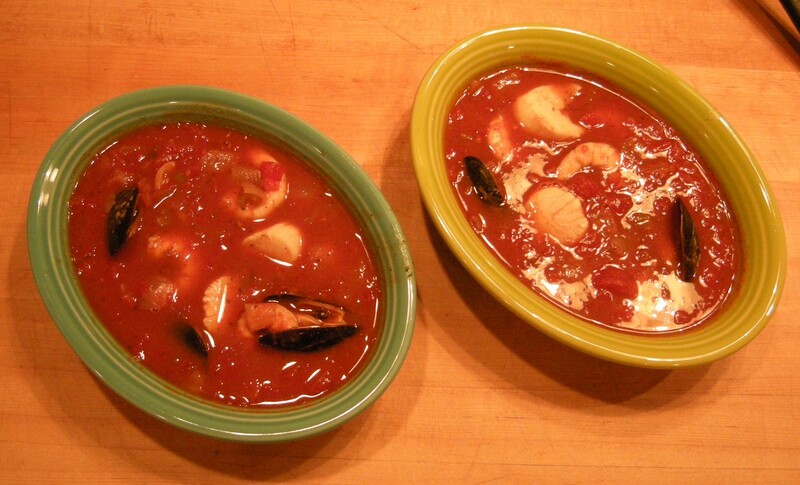 Today’s stew can incorporates wild seafood or store bought. Joe’s Fish Market in town is where we first bought this Yugoslavian seafood stew which was very hot and spicy. We loved it, but wanted to make it ourselves. I ask and it always seemed like the recipe was so simple, but I couldn’t quite achieve the flavor and deep mahogany color of the soup base like the one we bought. Then one day about a year ago the recipe appeared in the local paper — the original recipe was to make eight gallons of the base and someone cut it down to one gallon. So upon seeing the list of ingredients I embarked on making a gallon of it and with a little tweaking I was able to make a respectable version of it. One of the problems I discovered when looking for a recipe was that the soup originated on the Dalmatian Coast along the Adriatic Sea which is mostly in the country of Croatia. 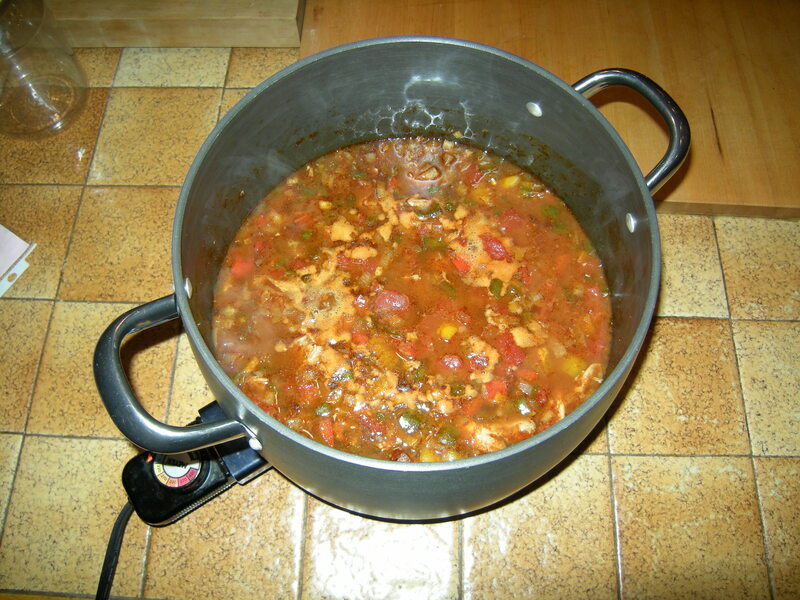 Since a lot of people might not find Dalmatian Seafood Stew as appetizing as Yugoslavian Seafood Stew the market altered the name. They were afraid people might confuse Dalmatian, which is the coast with Dalmation which is a breed of dog and not even want to try it. I may have had better luck finding a recipe if I had known that earlier. However, the recipe in the paper provided the ingredients list so I was able to learn what my stew had been missing. 1/2 pint of water (for the eight gallon recipe — the market adds 1 quart of water to 6 quarts of base and then cooks it down to the desired consistency before removing from heat and adding seafood). * Adjust amounts of cayenne, tabasco and red hot sauce to your desired hotness level. It’s easier to start with less and add more until you get the hotness you like. Selection of seafood: shrimp, acallops, firm fish such as salmon, talapia, calamari, clams, mussels, etc. Cut the fish into bite size pieces so that all the seafood is approximately the same size and then all will cook in about the same amount of time. HEAT olive oil in a large soup pot over medium heat. SWEAT onions and cook them for about 5 minutes. (Note: to sweat the onions leave the lid on to trap steam so that volatile oils remain in the pan). The onions shouldn’t brown so lower heat if they should start to brown, so they sweat and retain all their flavors. ADD celery and garlic and saute 2 minutes. ADD the parsley, oregano, basil ( Note: when adding dried herbs crush them between your fingers to release more flavor before adding them to pot), black pepper, white pepper and cayenne pepper. Cook about 5 minutes longer to concentrate the flavors. ADD chicken broth (wine/beer whichever you choose) and simmer another 15 – 20 minutes to reduce liquid. ADD tomatoes and tomato sauce (Note: this part I vary since I use home canned tomatoes, tomato juice and paste; but I try to use approximately the same amount). Cook another 15 -20 minutes. ADD Worcester shire, Tabasco and Red Hot sauces and blend in well. ADD sugar and granulated garlic and cook stirring about 5 minutes longer. (Note: at this point the base is done and ready to be cooled and frozen if desired). If making stew continue as follows. ADD water and simmer until it reaches the desired consistency which is almost the thickness of tomato sauce. TASTE at this point and adjust to attain the spiciness and hotness. you prefer. REMOVE from heat at this point and stir in seafood. The trick to cooking the seafood just the right amount is to let the hot soup base cook it. Using this method helps prevent overcooking of the seafood which makes it tough. Stir the seafood around in the hot base for about 5 minutes and when the everything looks done it is ready to serve. .This stew goes will with crusty French bread and a side salad of your choice. If this makes too much, part of the base may be frozen in a suitable amount and when thawed the appropriate amount of water should be added before heating it up to make the stew. I found the following recipe in an add for a subscription to Field and Stream magazine. I looked online but had trouble tracking down the source for this wonderful recipe. 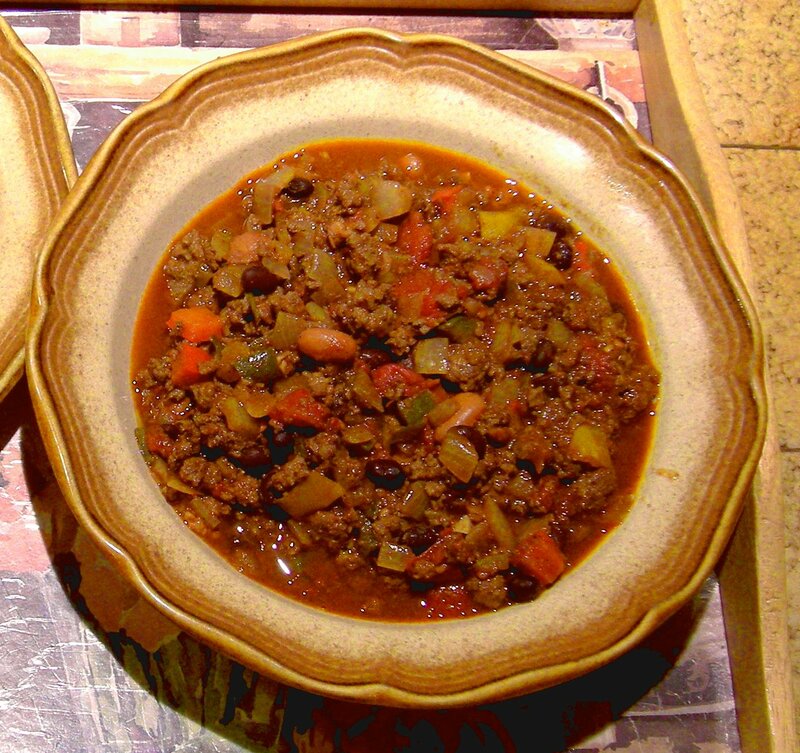 Not only is this chili one of the best tasting recipes I’ve made, but due to the various colors of bell peppers, tomatoes and two kinds of beans it is very colorful and looks really appetizing. I discovered it goes well with cornbread and the last time we made this chili we had friends over for dinner and one of them brought some ramp cornbread to have with it. 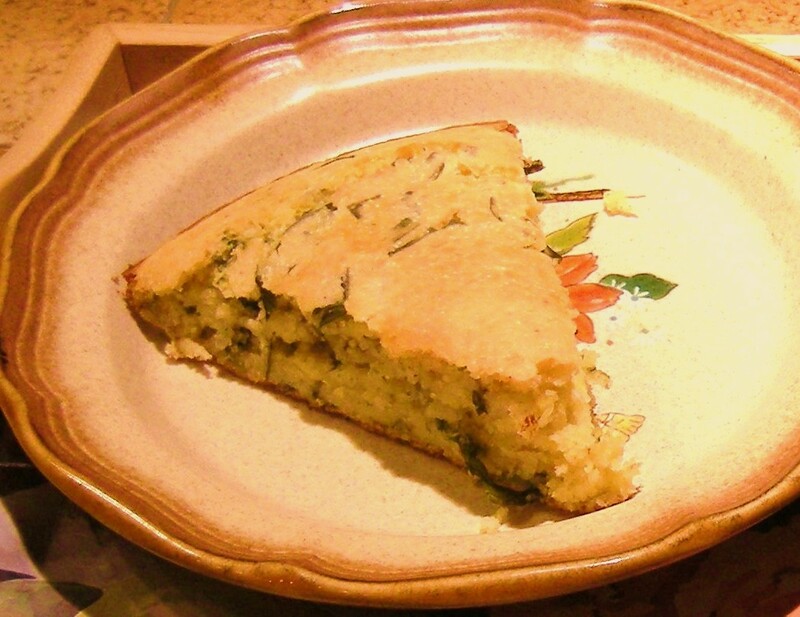 Ramps are a traditional spring delight to many mountaineers. Since the ramp cornbread went so well with this chili and I had some ramps in my freezer too; I made a pan of ramp cornbread to have with the leftover chili last evening. See notes below the recipe to learn other ways to change the cornbread if you do not have ramps as well as other helpful notes. In a large pan, sauté venison in batches until just cooked. Drain and set aside. In a large pot, sauté bacon until it has browned and released its fat. Remove and set aside. Saute onion and peppers in bacon fat stirring until soft, about 5 minutes. Add garlic and vinegar and cook for two minutes. Add chili powder, cumin, salt, pepper, cinnamon and chipotles (chipotles add heat and if minced w/ seeds will be hotter) then cook stirring frequently for three minutes longer. Add venison and bacon and stir cooking another couple of minutes. Add honey, molasses, beer, wine and tomatoes and mix well bringing to a boil. Lower heat and simmer for about one hour stirring often. Taste and adjust seasonings by adding more chili powder or chipotles if you want it hotter. Add beans (can be a mix or all of one kind) and cook 30 to 45 minutes longer until it is done and thick as you like. Garnish with chopped cilantro and serve. To make the cornbread, I used a Teay’s Valley cornbread mix (made nearby) and added about 1 cup of sliced thawed ramps from my freezer. Other things that could be added instead of ramps would be green onions, jalapeno peppers, bell peppers, green chilies or even chipotle peppers. 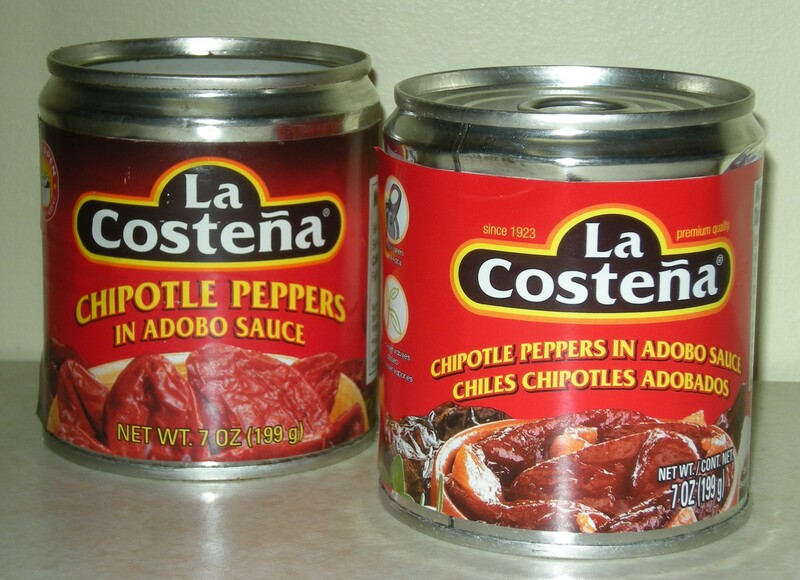 To see what chipotle peppers that I often buy check my post on Tortilla soups which shows the canned ones I can buy locally. Another helpful hint is I often buy peppers and cut them up and freeze them in batches for chilis, stews and soups. I measure out the amounts for various recipes, label them and freeze using a food saver which keeps them nicely. Any canned beans may be used in this recipe, I just prefer black and pinto beans — so feel free to add whatever kind you like.